Many Jewish thinkers of the Middle Ages grappled with the enigma of Exodus 3:14 and reached many different conclusions on its meaning. Most of these can be readily distinguished in relation to the single point identified above, namely the absolute and eternal versus the temporal connotations of the word ehyeh as it occurs in this verse. So, for example, Saadia Gaon, Maimonides, Sforno and Joseph Albo interpreted ehyeh in terms of the absolute and eternal existence of God, while Rashi, Ramban and Judah Halevi interpreted it in relation to His actions in history and so to temporal existence. Saadia’s interpretation of Exodus 3:14 has already been considered in Jewish Bible Translations above and as noted there is in terms of the eternality of God. Joseph Albo interpreted the verse along similar lines to Maimonides, while Ramban’s interpretation includes features of Rashi’s, Halevi’s and Maimonides’ and was to substantially influence Sforno’s some two centuries later. In what follows I will consider only the interpretations of the latter four, thus analysing two from either side of the exegetical divide, and will conclude by looking briefly at the contributions of two 12th century exegetes who were also Hebrew grammarians for the light their analyses shed upon the verse. Foremost on the absolute and eternal side of the exegetical divide is one of the most remarkable figures in Jewish history, the 12th century philosopher Moses Maimonides. His interpretation of Exodus 3:14 is the subject of Chapter Sixty-Three of Part I of his Guide where it is addressed in the context of his efforts to reconcile the numerous biblical Divine names with the perfect unity of God. Maimonides contended that all of the Divine names in the Bible refer to God’s actions, with the exception of YHWH which he identified as the only proper name of God. However, he did not account for all of the Divine names in this way. The two exceptions were Yah, to which he ascribed the meaning of eternal existence, and ehyeh asher ehyeh. Maimonides was of course aware of the Talmudic identification of ehyeh asher ehyeh as a Divine name but he also evidently shared the widespread incomprehension as to its meaning, and so the challenge he had before him was how to reconcile this unexplained but rabbinically-established name with his own passionately-held conception of the perfect unity of God. It evidently did not suit his purpose to emphasise the presence of a name in Exodus 3:14 because he did not do so. Indeed he scarcely refers to a name at all, describing ehyeh asher ehyeh in such terms only once, only in passing and only without any further comment or explanation as to how it could be so understood. However, he did find a place for ehyeh asher ehyeh in his philosophical scheme of things but did so only by treating Exodus 3:14 as a means to an exegetical end rather than an exegetical end in itself, just as others had done before and others would do again. Briefly stated, Maimonides identified ehyeh asher ehyeh as a Divine name but he expands on it only in terms of it being the “explanation” of the name YHWH and as the “idea expressed by the name” YHWH. In relation to this he contends that ehyeh derives from the verb root hayah and connotes the idea of “existence”. He interprets the question Moses asks God in Exodus 3:13 as Moses anticipating that the Israelites would not believe in the existence of God and so he asks God how he can demonstrate His existence to them. Maimonides thus interpreted ehyeh asher ehyeh as God’s instruction to Moses as follows: “Then God taught Moses how to teach them, and how to establish amongst them the belief in the existence of Himself, namely by saying, Ehyeh asher Ehyeh”. The closest he comes to a translation of ehyeh asher ehyeh is: “He is the existing Being which is the existing Being”, which is evidently influenced by the Septuagint translation (see Early Jewish and Christian Translations). Maimonides develops his interpretation along the lines that God then taught Moses the “intelligible proofs” by which His existence could be confirmed, which proofs are presented in Part II of the Guide and are comprised of twenty-six principles of Aristotelian physics and metaphysics in addition to a philosophical treatise of his own. The declaration ehyeh asher ehyeh is interpreted as a summary statement of these philosophical proofs. There are numerous problems with Maimonides’ interpretation, of which I will mention only three. First is that his translation of ehyeh asher ehyeh reflects neither the vocabulary nor the grammar of ehyeh asher ehyeh and so it cannot be a true translation of it. Specifically, Maimonides translates ehyeh asher ehyeh in the third person instead of the grammatically-correct first person, thus making of it a declaration that Moses was to say to the Israelites although he was in fact instructed by God to say only ehyeh to them. Second is that he does not address the ehyeh of Exodus 3:14b at all, never mind identifying it as the name in the verse. Third is that his interpretation requires us to believe that Moses presented the Elders of Israel with an extensive treatise on Aristotelian thought and in so doing proved to them the existence of God, which I reject by reason of extreme implausibility. The sixteenth century Italian biblical commentator Obadiah Sforno also took a rational approach to the interpretation of Exodus 3:14. He interpreted the question of Exodus 3:13 just as Ramban (aka. Nahmanides) had done before him, which was not so much as a request for God’s name as for an identification of the Divine attribute by which Moses would deliver the Israelites from servitude. He therefore understood the question of 3:13 to mean, “By what function emanating from Him, by which He can be called by name, did He send you to deliver us?” Like Maimonides he found his answer to this question in Exodus 3:14 and did so in an interpretation that combines elements of Maimonides and Ramban. Having first proposed that a name reveals the essential nature of the one named, Sforno then interprets ehyeh asher ehyeh in similar terms to Maimonides with, “He whose existence is constant and consistent, and whose essence is His existence”. Also like Maimonides, Sforno does not make any comment on the absolute ehyeh of 3:14b let alone identify it as a name. He proceeds to identify justice and righteousness as the Divine attributes that would deliver Israel from servitude, just as Ramban had identified mercy and justice in that role, and like both Ramban and Rashi before him he finds the expression of these attributes in God’s contrasting actions towards Israel and Egypt. My objection to Sforno’s interpretation is simply that his understanding of Exodus 3:13 is completely unsupported by the biblical text and is in my opinion completely incorrect. Hence whatever response the above question elicits can only be incorrect. Moreover, by failing to mention the absolute ehyeh of 3:14b, Sforno, like Maimonides, demonstrates his misunderstanding of the verse as a whole and so his interpretation as a whole can only be incorrect. Foremost of the exegetes on the temporal side of the exegetical divide is Rashi, who is generally regarded as the leading Talmudic commentator in Judaism and the foremost rabbinic commentator on the Bible. These credentials bear ample testimony not only to his prodigious energy and intellectual brilliance but also to his traditional approach to interpretation. On account of the latter, the great majority of Rashi’s biblical interpretations are derived from traditional rabbinic sources and it is therefore not surprising that his interpretation of Exodus 3:14 is taken entirely from Berakoth 9b2 and its corresponding interpretation in Exodus Rabbah 3:6. Such was his dedication to tradition that Rashi did not add anything to these interpretations. However, an important clarification did eventually come in the 17th century from Samuel Edels (aka. Maharsha). He emphasised that God did not change His mind in response to an appeal by Moses and confirmed the obvious implication of the biblical text, which is that the words ehyeh asher ehyeh were addressed only to Moses. The interpretation of Berakoth 9b thus underwent a series of refinements over a period of more than a thousand years and over that course of time reached a point where several of its more obvious problems had been resolved. 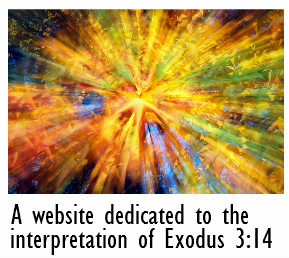 However, there remain the outstanding problems of the unrecorded question that we must believe Moses asked between the declarations of 3:14a and 3:14b, and the question of why a simple addition to the obviously cryptic words of this verse was not communicated by God in the first place if its meaning really is so simple, and the unlikelihood of such an unremarkable meaning being communicated by God in such enigmatic terms on the occasion of this most memorable and striking encounter. Despite these drawbacks it remains the interpretation accepted by the majority of religiously educated Jews on account of its origin in the Talmud and its espousal by Rashi. In Herczeg’s elucidation of Rashi’s interpretation of Exodus 3:14 in the Sapiristein Edition Rashi, he identifies both ehyeh asher ehyeh and the ehyeh of 3:14b as Divine names, proposing the latter as a shortened version of the former. In the Schottenstein Edition Talmud, Zlotowitz recognises only the ehyeh of 3:14b as a Divine name. Neither of them attribute their identification of these names to any particular Talmudic commentator and so, because I am unaware of Rashi having identified either declaration as a name, I do not know to whom I should attribute Herczeg’s and Zlotowitz’s comments. I think they are unlikely to be their own because both are Orthodox Jews and thus deeply committed to the transmission of traditional Jewish interpretations of the Torah, but I am unaware of any traditional source that identifies ehyeh as a divine name and so I don’t know where they’re from. Judah Halevi presents his interpretation of Exodus 3:14 in The Book of the Kuzari in the context of his discourse on Divine names. Like Maimonides he identified YHWH as the proper name of God and proposed that the name Yah has a similar meaning to YHWH. In contrast to Maimonides he correctly identified the ehyeh of 3:14b as the Divine name in this verse but like Maimonides he understood the word ehyeh to be derived from the verb root hayah and to convey the meaning of ‘to exist’. However, by way of explaining the name ehyeh, he contended that its effect was only to create “the tendency to prevent the human mind from pondering over an incomprehensible but real entity” and in so doing eschewed a philosophical interpretation of the verse. Halevi paraphrases God’s words in Exodus 3:14 as follows: “What have they to ask concerning things they are unable to grasp? Say to them ehyeh, which means: ehyeh asher ehyeh, the existing one, existing for you whenever you seek me. Let them search for no stronger proof of my presence among them, and name Me accordingly. Moses therefore answered “Ehyeh has sent me to you””. Halevi thus appears to have understood ehyeh asher ehyeh as the explanation of the meaning of the name ehyeh and to mean, “the existing one, existing for you whenever you seek me”. The name ehyeh is thus understood to be a statement of God’s existence and availability to Israel but also to be a declaration by God that this assurance would have to be confirmation enough for the Israelites that He is with them, which strikes me as being very optimistic. However, despite the fact that Halevi’s interpretation has Moses correctly saying the ehyeh of 3:14b to the Israelites, it nonetheless exhibits the same error as many others have done. His interpretation implies not only that ehyeh asher ehyeh contains the meaning of the message Moses was to convey, but also that it was to be spoken to them as part of that message, which as noted above has since been refuted by no less an authority than Maharsha. Finally to the contributions of two 12th century exegetes who were also Hebrew grammarians: Abraham Ibn Ezra and Rashbam. First to Abraham Ibn Ezra, who often consulted his good friend Judah Halevi on matters of exegesis and grammar. These exegetical discussions evidently included the interpretation of Exodus 3:14 because not only do they both correctly identify ehyeh as the Divine name in this verse but also they both find the meaning of this name in ehyeh asher ehyeh and identify Yah as a related name. However, Ibn Ezra was bolder than Halevi in certain very important respects and most especially in regard to his grammatical analysis of the verse. Briefly stated, Ibn Ezra identified the first ehyeh of ehyeh asher ehyeh as a Divine name and proposed that the asher ehyeh fragment of this declaration explains the meaning of the first ehyeh. He further stated that ehyeh and YHWH are both proper names of God and even that they have the same meaning, the only difference between them being that ehyeh is in the first person while YHWH is in the third. Ibn Ezra thereby implicitly identified ehyeh as the name YHWH when employed by God in naming Himself. He did not separately mention the ehyeh of 3:14b but the similarity of his interpretation to Halevi’s strongly suggests that he did regard the ehyeh of 3:14b as the Divine name and so presumably identical in meaning to the first ehyeh of ehyeh asher ehyeh. The second of the two grammarians, Rashbam, went one step further again in that he did specifically identify the ehyeh of 3:14b as the first person form of the third person name YHWH, and so he explicitly identified it as the name YHWH when used by God in naming Himself, which exegetical development brings us fittingly to the interpretation of Exodus 3:14 in Kabbalah.